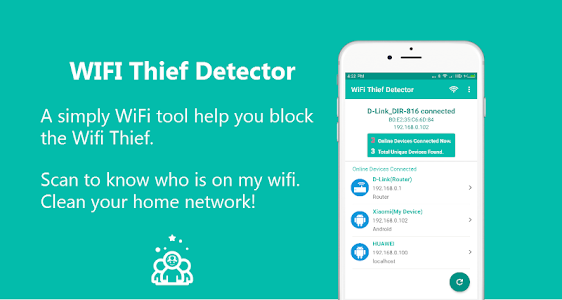 WiFi Thief Detector is the best Netcut / WiFikill app and WiFi blocker / WiFi thief blocker detecting who use my WiFi to protect my wifi security. 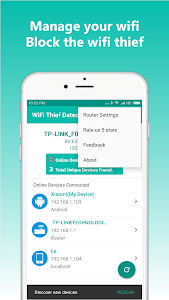 WiFi Thief Detector can improve your wifi booster signal and enhance your Internet browsing experience with wifi repeater, and help your devices connect to the internet more faster. 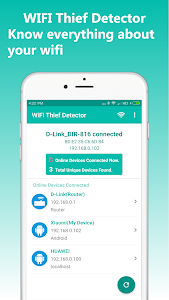 WiFi Thief Detector is powerful WiFi Protector and WiFi Monitor for wifi security and improve your wifi booster signal like WiFi Extender/WiFi Range Extender and WiFi Repeater. WiFi Thief Detector is the simplest wifi scanner that allows you to detect who is on my wifi. it's the Best Netcut/WiFikill app for you to block the thief in router settings from my wifi. 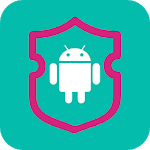 Do you want a powerful netcut or wifikill app to protect wifi security? Do you know Who Use My WiFi and connected to my wifi and wireless network without your permission? Do you know if someone is stealing my wifi network speed? Do you know if someone are stealing my wifi when your connection is slow, and who is on My WiFi download something? Do you know if neighbors may have access to your personal data? Do you want to prevent how to get free wifi? 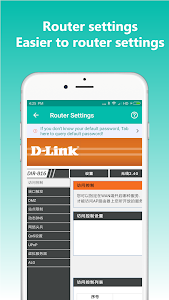 Don't worry, WiFi Thief Detector can easily scan my wifi and see how many people or device connected to your network router such ar tplink/tp-link router, dlink router, netgear router or huawei router etc. 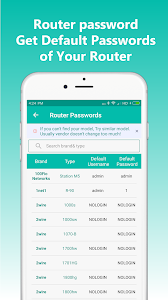 Using WiFi Thief Detector, in seconds you know how many and which device is connected to your wireless router with IP, MAC ID and vendor listing. WiFi Thief Detector always find all connected devices on my wifi!! Check who is using my wifi!! WiFi Thief Detector comes with a clean and neat design, and the interface is so user-friendly that doesn’t take a genius to track the connected users and devices to your wireless router. 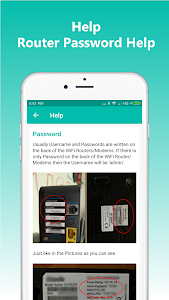 WiFi Thief Detector is fast, smart and reliable. WiFi Thief Detector, shows some information about the wireless network, like MAC, Ip and Name, and it also lets you know about the devices connected to your wireless network. So, you can easily find out who is using your wifi and what their devices are. 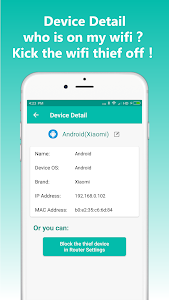 So, if your wireless network is on a limited plan and you believe someone is sending and receiving data, install this Wi-Fi monitor app for free and look for the suspicious devices connected to my WiFi. - Add more tools such as ping, wifi list, whois etc. Similar to "WiFi Thief Detector - Who Use My WiFi?"